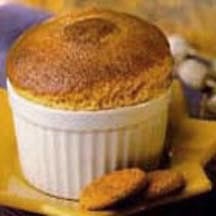 Spray 4 (8-ounce) soufflé dishes. Dust with sugar. Set aside. In large bowl, beat egg whites with cream of tartar until foamy. Add sugar 2 tablespoons at a time, beating constantly until sugar is dissolved and whites are glossy and stand in soft peaks. Set aside. Beat egg yolks until thick and lemon-colored. Thoroughly fold in pumpkin and spice. Gently fold yolk mixture into beaten whites. Spoon into prepared dishes. Place cups in baking pan. Fill pan with very hot water to within 1/2-inch of top of dishes. Bake in preheated 375°F (190°C) oven until puffy and delicately browned, about 15 to 20 minutes. Top with crushed gingersnaps, if desired.